Orthodontists sometimes struggle with trying to get their general dentist colleagues to send patients early. In fact, parents may assume that their dentist is considering future alignment and development of the arches when they see our children for regular cleanings however the dentist will likely not even see the patient since the hygienist is the one cleanings the teeth and taking the limited X-rays (as insurance allows). Neither the dentist or the Hygienist are trained extensively in orthodontics (which is a 3 year residency AFTER dental school) so they may not see an issue until it is fairly extensive (or even too late) hence the American Dental Association (ADA) and American Association of Orthodontists (AAO) recommend kids see the Orthodontist with or without a referral by age 7. Keeping this in mind, one of the most significant early problems we encounter are impacted teeth, early identification becomes extremely important. And although there are times when a tooth just starts in the wrong place (or upside down/sideways), the majority of impacted teeth start in a fair to good position only to turn as they develop due to a lack of space, retained baby teeth or a size discrepancy between the bone and the size of the teeth. Identified early, these cases can be treated early to avoid surgical intervention or extraction of permanent teeth (which can have a significant bearing on the facial profile in the future). These patients may look quite normal to the hygienist or dentist but an Orthodontist, specifically trained to identify these issues early, can spot the signs and investigate a bit deeper to see if early treatment is warranted (or at least suggest treatment before it is too late to correct). 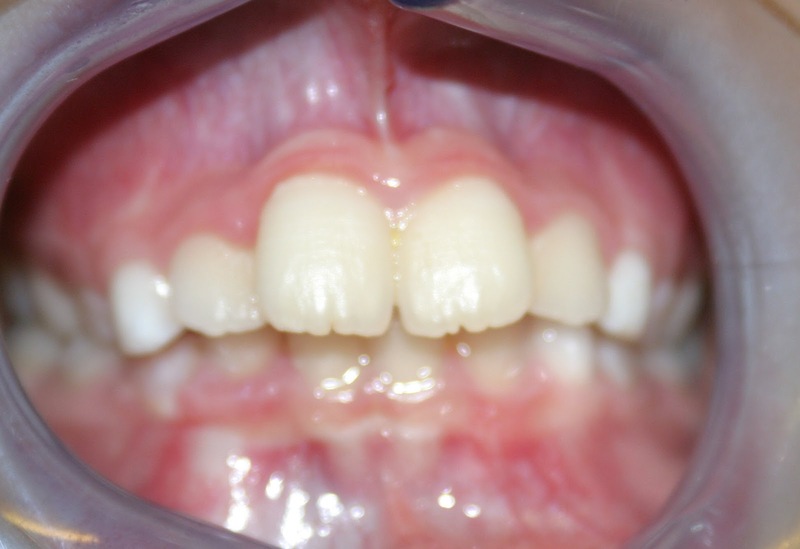 Consider the following photograph of an 8 year old patient with generally good alignment. Of course it is completely obvious that the lower left cuspid has become impacted and transposed with the adjacent incisor. At this point, the only treatment is removal or surgical exposure with full braces to pull the impacted tooth back into position (risking root damage to the adjacent tooth). Had films been seen earlier, the upper arch could have been restored to stop constriction to the lower arch; the baby canine could have been removed early and we may very well have prevented the impaction altogether. The dentist informed me that the insurance only paid for this X-ray every 3 years so there wasn’t one taken recently. This happens even more frequently in the upper arch. In this second patient below, again a sibling of another patient that was not referred from her dentist, you will notice the same constriction and narrowness in the arch forms (front teeth are prominent and side teeth are in a shadow). I again suggested a screening X-Ray which you can see next to the photo. As the circles show, both upper canines have become impacted due to the narrow upper jaw form (small jaw with normal sized teeth); as the canines began to develop and erupt, they were blocked by shear crowding of the adjacent teeth. Instead of growing down into position, they pushed toward the midline crossing adjacent roots and becoming stuck against the side of the nasal cavity. These teeth will now require full surgical exposure and 3 years or more just to pull them into position. So what can an Orthodontist do if he/she catches such an event early enough? And can these teeth be corrected once they begin to cross over? Well the answer is …. sometimes. It will depend on the age, stage of development of teeth and bond, compliance and experience of your Orthodontist. The only way to know for sure is to allow the Orthodontist to see your child by age 7, before the construction begins to affect the eruptions. In the 9y 8mo old patient below (again I would have caught this much earlier had they come to see me by age 7), X-rays revealed a similar impaction of upper canines. Note that the canine on the top left of the film (which is rotated as well) is already crossed over the lateral incisor and both cuspids have affected the root development of the lateral incisors. The photo again reveals a narrow upper arch constricting the side teeth. 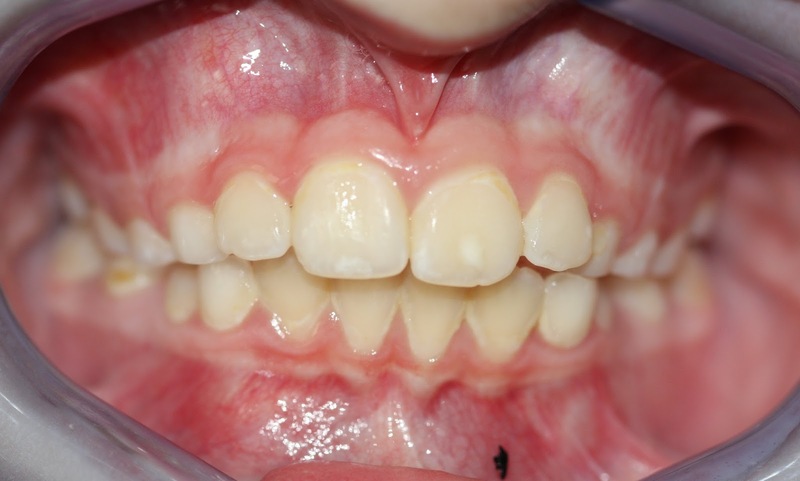 A bonded palatal expander was placed to widen/restore the upper arch form while limited braces were placed to align front teeth and shift roots away from the canines as space was created through expansion. The series of X-rays below were taken every 4 to 6mo to monitor roots. This case is one of the more severe impaction cases still treatable; but the impacted teeth would have been visible at least 1 to 2 years earlier making early correction less extensive and more predictable (by identifying a narrow arch early and restoring the arch width BEFORE the canines start trying to erupt); Any Orthodontist will agree that most of the time, if teeth have space to erupt, they will erupt into normal position with the tongue guiding them on the inside and the lip pressure from the outside. We just have to provide the correct balance or equilibrium in the mouth to allow for the normal eruption that is programmed into most kids. So when you are wondering if your pre-teen “needs” to see an Orthodontist, don’t rely on those that aren’t fully trained in Orthodontics and Dentofacial Orthopedics (or even worse, not trained at all in the case of Dental Hygienists); dentists are great at restoration/replacement of teeth and Dental Hygieists are the best at cleaning teeth and preventing disease but it is not logical to assume they will know everything needed to predict or even identify early problems. Instead trust your local Board Certified Orthodontist to take a look and guide you to a better smile. That initial free visit with your Orthodontist may give you just peace of mind or may save your child from surgery and/or extraction of teeth later while putting them on a path for that perfect smile (with perfect function) we all want for a lifetime of enjoyment! Dr. James R. Waters is a 1996 graduate from UTHSC Dental School in San Antonio, 1997 graduate of Advanced Dentistry from the UNMC in Nebraska and the 2001 Valedictorian graduate from the prestigious Saint Louis University Orthodontic Program receiving the J.P. Marshall award for clinical excellence in 2001. He holds a Bachelor’s Degree in Science, Doctorate in Dental Surgery, a post-doctorate certificate in Advanced Dentistry, post-doctorate Degree in Orthodontics & Dentofacial Orthopedics and a Master of Science Degree in Orthodontics. Dr. Waters and his wife of 20 years live in Austin, TX with their 4 children where he has a thriving, multi-faceted Specialist practice with locations in Steiner Ranch and North-Central Austin.